No more guessing your sales tax rates. Find your custom rate with the sales tax calculator. No more guessing your sales tax rates. Find your custom rate with the sales tax calculator. *Enter full U.S. address for a more accurate rate. This free service is for illustrative purposes as-is without warranties. If you intend to rely on these rates, please utilize QuickBooks Sales Tax. The sales tax rates provided are an estimate based solely on the location information entered into the Sales Tax Calculator and should not be considered financial, legal, or tax advice. Other factors that impact sales tax rates include product type, customer type, and shipping address. 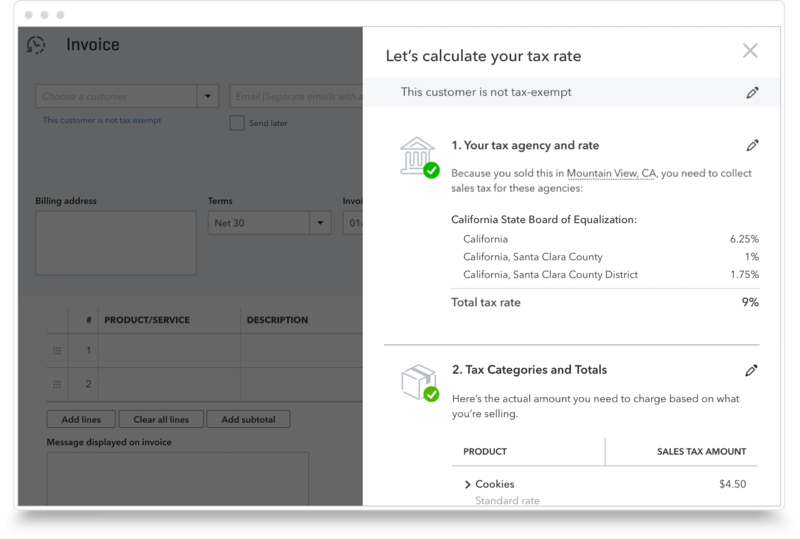 For the most more accurate rates for your small business transactions, try QuickBooks Sales Tax. 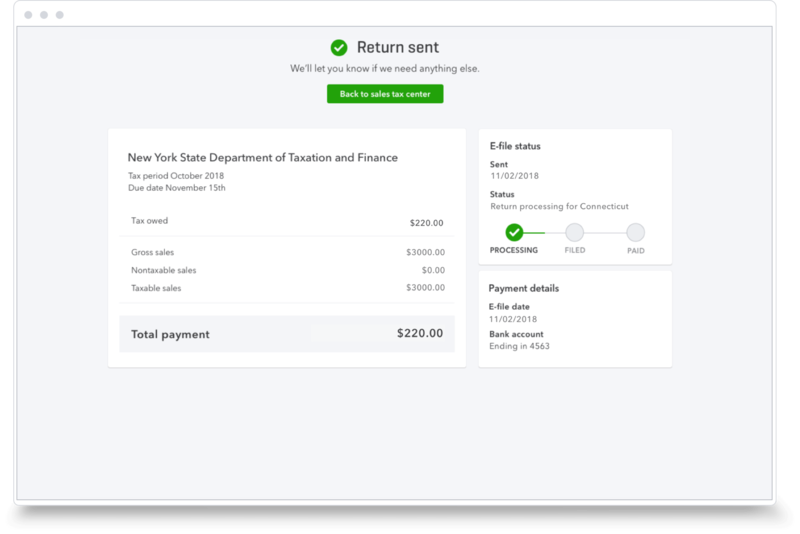 When you add sales tax to an invoice, the calculations are automatically taken care of. We’ve done the math for you on thousands of state, city, and county sales tax rates around the U.S.
Rules for Product taxability can change by state to state. 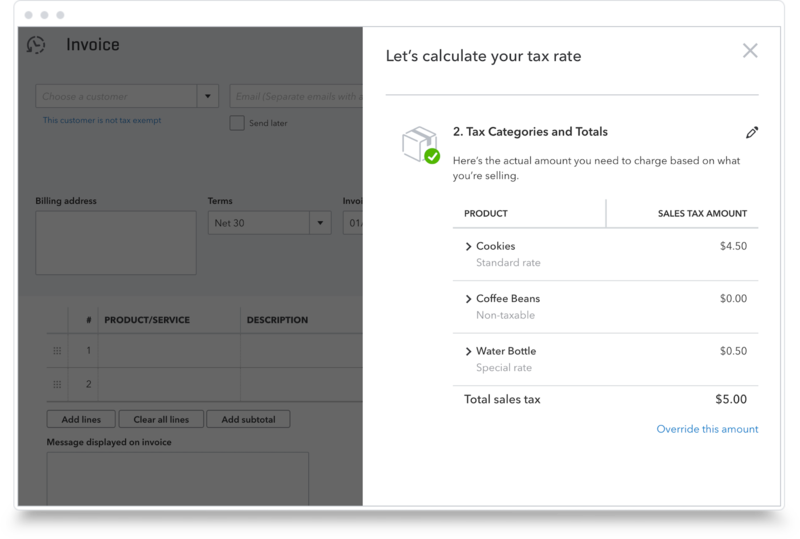 Once your products are categorized, QuickBooks will make sure the correct rate is applied to your transactions based on the location of sale you indicate. You can access your sales tax information on demand with the Sales Tax Liability Report. This report will keep you up to date on how much you’ve collected and what you owe, all broken down by tax agency. When it’s time to file, you can choose to file electronically or manually. Either way, we keep track of payment due dates so that you can avoid fees. We track both state sales tax and local sales tax due dates. There are 45 states and the District of Columbia that require businesses to collect sales tax. If you sell goods (and certain services) in one of these states you are responsible for calculating, collecting, and paying sales tax. Each state has its own set of laws and rates for sales tax. On top of state requirements, counties, cities, and districts may have their own sales tax requirements. Economic nexus – To have economic nexus in a state is to have made a certain amount of sales or a certain number of transactions into that state. Economic nexus obligations already exist in multiple states with additional states enacting economic nexus rules in light of the 2018 Supreme Court decision in South Dakota v. Wayfair. Bottom line is that if you have nexus in a state (physical or economic nexus) you have an obligation to collect and remit sales tax for taxable sales within the state. I'm an online seller, how do I collect sales tax for customers that I ship to out of a state? In the past online sellers typically would not need to collect sales tax for out of state sales if they did not have a physical presence in the state. Recent tax laws have changed this and now sellers are responsible for collecting sales tax on shipped items if they have an economic nexus with a state. Online sales tax varies from state to state and is dependent upon if you have nexus with that state. Keeping track of sales tax can get messy, but we’ve got your back. 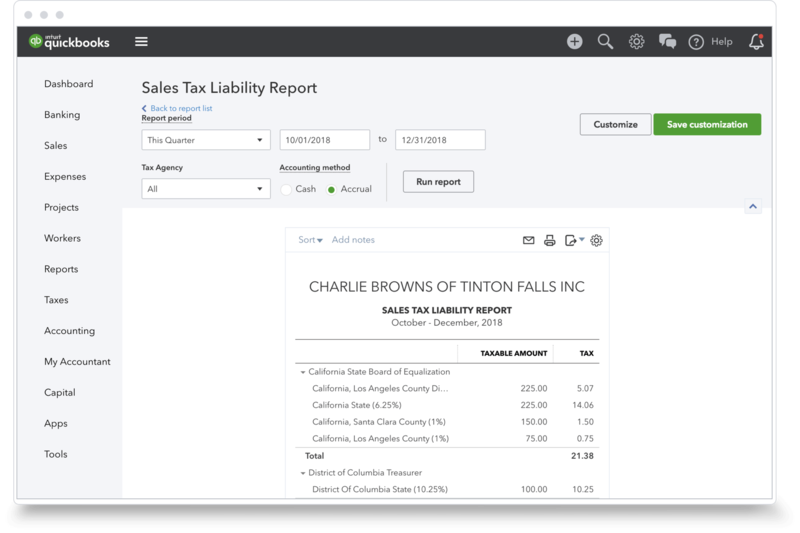 QuickBooks Sales Tax automatically applies applicable sales tax rates to your invoices. We take into account all the variables and apply the correct rates every time. and more with QuickBooks Sales Tax.